What Should Your Graduate Know? Well-designed school facilities can improve efficiency and lower operating costs but also elevate the learning experience, says Taryn Kinney, a principal with the integrated design firm DLR Group. 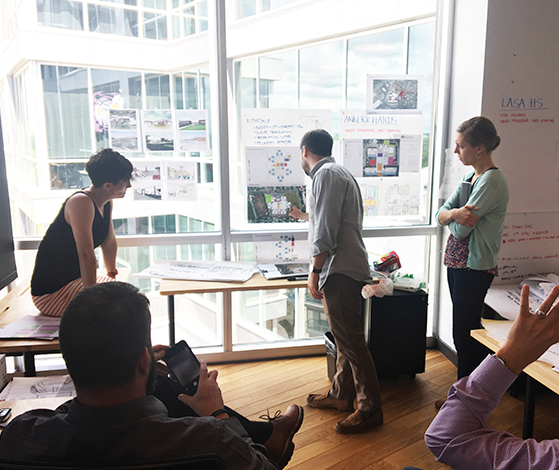 Architecture is one piece of an equation that can “actually move teaching and learning and the human behaviors that happen within a school forward,” Kinney says. When initiating the vision, planning, and design process with a district for a new or remodeled facility, “we have the opportunity to share what we’re seeing” across the country and internationally, in terms of architecture, education innovation, and creativity, says Kinney, who heads the firm’s K-12 Education Studio in Texas. That can be of particular value to districts, who, because of finances, time, or other constraints, may have limited access and exposure to these developments, she says. What is the connection between school building design and academic engagement? School board members ask us all the time: Why would we invest in these new environments if we don’t know that they work? Working with research and data analysis experts, DLR Group developed a Student Engagement Index and a Teacher Engagement Index to help answer the question: Can we demonstrate a connection between the design of the physical environment of a school building and student academic engagement? In a survey, we ask a broad range of questions about acoustics, air quality, temperature, furniture, ability to move around in class, what types of spaces are used, and what types of learning activities students are doing. So far, over 3,000 students have taken the survey and over 300 teachers, and we have seen a positive correlation between space and engagement. What are some current education trends influencing school design? Schools, in the past, defaulted to a lecture-based, sit-and-listen environment for a lot of reasons: partially because it’s easier or more efficient in terms of space and time. But what we’re finding is that specific teaching and learning approach is not effectively preparing students for their futures. To prepare all students, not just a few that can learn well under the direct-instruction method, we need to find ways to engage learners across the spectrum. Large, multi-use spaces provide room for students to be active, and to engage in some kind of physical activity, whether that’s just walking around the room, standing up, or having room to build projects. Plus, there’s more of an emphasis on social and emotional learning, and to support that, we need to help students choose the appropriate space for learning activities that range from individual focus time all the way to making social connections with peers and teachers. Schools designed decades ago, with closed boxes, did not encourage collaboration to occur between students and educators or even student to student. But now you see varying sizes of break-out spaces where students can interact with their teachers in a one-on-one or group setting. Are there advantages to flexible classroom spaces? The space must fit the need for the learning activity. Flexible spaces can allow a teacher to gather three classes, or 90 students, together for a special project, or to break that group into small groups, some of whom need a quiet area for research. Some may be working individually, while another group works with the teacher. Not every day is the same, and not every space should be designed the same. Transparent and moveable glass partitions provide acoustic separation, while also allowing teachers to keep an eye on all students, whether they are working in small or large groups. How are concerns about security impacting school design work? There’s a lot of work going on in this area. Some of my colleagues are involved in committees with A4LE (Association for Learning Environments), which has an active task force researching this topic. There are a couple of ways to look at it. The first thing to consider is sight lines. I’ve had police chiefs tell me repeatedly that from the road to the point of entry is the most important element to consider. Having clear sight lines, and a well-maintained site that’s perceived to be in use and cared about, could potentially deter a malicious event. The main entry adds another level of security. Most new facilities have a secure vestibule to monitor who is entering and exiting the school. In addition to the tragic events such as school shootings, educators have other daily concerns such as bullying, harassment, and other behaviors. Designing spaces where students and teachers can develop positive relationships could help to prevent or deter bullying and other tragic events from happening.